Peter Walsh, OfficeMax, and me, Oh My! So earlier this week, I was flown to Chicago to participate in a Webcast helping parents to organize their students for back to school. Sponsored by OfficeMax and hosted by Peter Walsh (of TLC’s Clean Sweep and Oprah fame), the half-hour show invited over 200 mom-bloggers to tune into the live online broadcast, followed by a Q & A with us for 20 minutes over Twitter. Working with Walsh was a pleasure in the way that it’s a pleasure to work with an administrator that you know is the best at what they do. In fact, I found myself likening Peter to a fairy tale principal, albeit one that has been given the time and authority to participate in and improve on every element of their school, and who has knowledge of how each element plays its part in that school’s success. I know, a mythical educational world at best. I’ve written before about the disillusionment and the broken promise made to teachers, but the fact is many principals also believed their job was going to be one thing, only to find it had become another. For instance, many principals don’t have the contact with the students or the teachers that they wish they had. I’m sure many principals never imagined that their own job would be as nomadic as it has become, bopping from school to school both within and without of the same district, climbing a ladder based on the desires of their superintendent or the needs of their county. I’m also sure no principal ever imagined that their days would be spent crunching numbers, talking administrators down from the rafters, and constantly being sent off campus in search of the next silver bullet. Just as many teachers must fantasize about inspiring each student, coaxing that light bulb to go off over each and every kid’s head, many principals must dream about taking an under-performing school and pulling it up by its bootstraps with tough love and hands-on understanding. They must dream of taking a jaded staff and inspiring them to see the possibilities in each student. They must dream of taking a school of broken windows and commanding a community to rebuild, investing in their children and their education. So what does this have to do with Peter Walsh? Well, during rehearsals and pre-recordings, I had the opportunity to watch him work, to watch how he treated people and how he got the most out of their abilities. I couldn’t help but think about him as a great principal. He trusted what each of us brought to the production, but his influence in each of the components made the overall product better. His big picture vision of the whole webcast guided each question he posed to each department. His big picture vision of the whole webcast guided each tweak, each deletion, each addition, and each comment. He made sure he knew what each person was doing and how that contribution added to the message. He treated people well and with equity. He talked to them with respect, bringing them into the decision-making process so that they all owned what part they played in the production. He worked with the experts involved, the writers, the director, the camera crew, the sound crew, the publicity department. I have been lucky to work with some great principals in my time as a teacher, but I’ve also worked with some doozies. Does Walsh not seem like the principal we all wish we had? One that understood the efforts of each member of their team – one that worked to put out a positive message about their school and their students and about the great stuff happening in their school – one that participated in curriculum discussions, publicity efforts, discipline, honest discussion with parents, faculty, and staff, and stayed with a school and district for the long-haul, investing themselves in the community around them? Sadly, principals aren’t allowed to do all of these things, what with their plates being full of side dishes like funding, PI, and test scores. And many times districts see a great principal starting to brighten a school, and before great reform can deeply embed itself into that school, they whip that person out of that position and into the next one, thinking that they will leave behind a wake of pixie dust that will influence any school that they touch down in, however briefly. 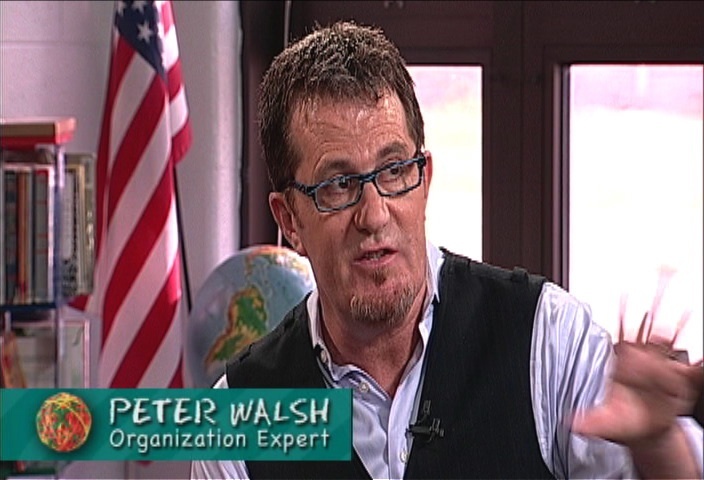 Peter Walsh cares about his message to his audience, and the quality of its execution. He worked hard this week with each component in the production to see that everyone’s abilities contributed to the message. In the end, OfficeMax wanted to sell product and Peter Walsh wanted to help parents organize, but as the whole Twitter panel sat at our computers, answering tweets from around the country, there wasn’t a person who wasn’t moved by the greater good we all could say we were a part of: that of helping our public schools. Please donate to schools. Donate supplies, time, and efforts. Thanks for reading Tweenteacher. Many thanks to OfficeMax for all of their hospitality and for allowing me the opportunity to get out the message of schools in need. Additional and deep thanks to Beth Cleveland at Elm Public Relations. Follow her on Twitter @News_Source. Follow Tweenteacher (that’s me!) on Twitter @tweenteacher. What a great post, Heather. So insightful and practical — thanks for giving the teacher’s perspective! Great post! It’s neat to get your perspective, Heather. I agree the blogcast was all about supporting teachers and parents nationwide as everyone returns to school this year. Thanks so much for your contributions. I just googled the podcast. It looks great. I must use it at the beginning of our school year in Australia. Also, it is very common in Australia for parents to be asked to send in class supplies, even for child care (as I do with my toddler). As a teacher I certainly appreciate the donations, and as a parent I understand my small donation can go along way. Off to check out more of your blog. Thanks for checking out the site! Hope there are other resources that you find helpful (or at least give you a laugh). I love that helping out the Australian schools is standard for parents. Sigh. Would that it were here too. Many times schools compensate because families can’t, and its become common for schools to provide instead. Thanks for commenting and I hope to hear from you again soon! ??????? 777 - ??????? 777 ????????????? 2015????????????????10% ? ????????! ? ?????????????? ? 100%?????? ? ???????(????)!? ????????????? ???? : ??????????????????????????????????????? « Dear Parents: What happens in the testing room?